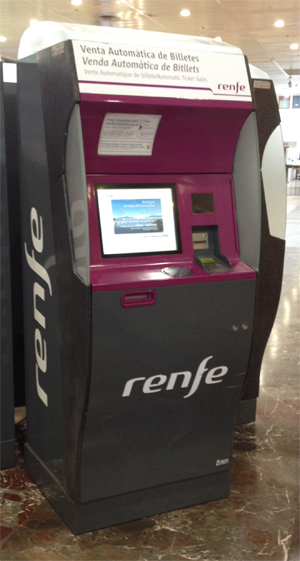 This guide contains step-by-step instructions for collecting Spanish rail tickets from Renfe self-service machines in mainline railway stations. Which tickets can be collected? 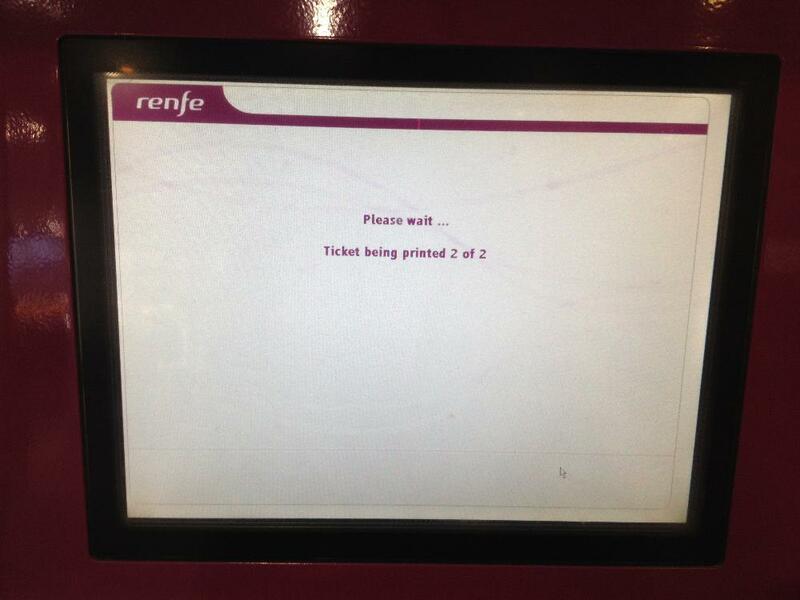 All Spanish rail tickets purchased on Loco2 are issued as print-at-home tickets. These should be printed on plain (A4/letter) paper prior to boarding the train whenever possible, and cannot be presented on a mobile device. It is possible to use the reference number ("localizador") from the ticket PDF to collect domestic Spanish tickets at the station before travel. However, this only works for journeys within Spain. 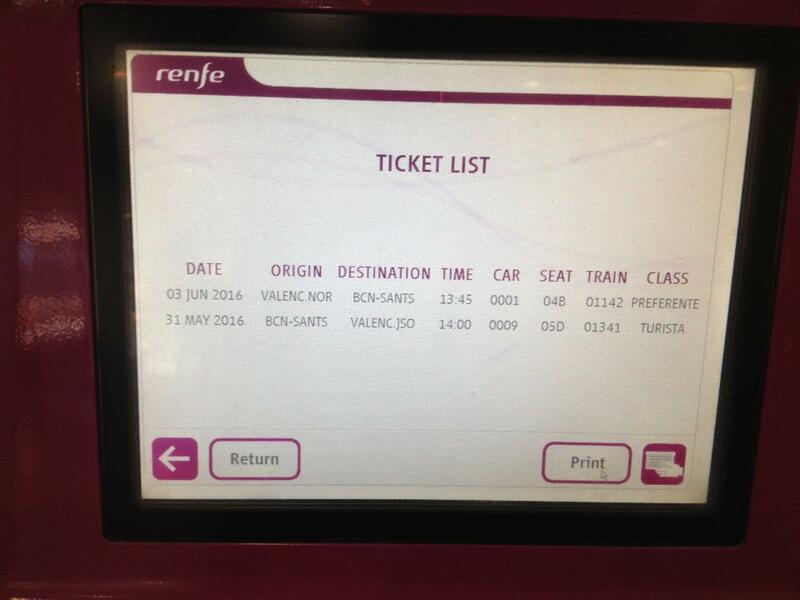 It is not possible to collect international tickets such as Renfe-SNCF (e.g. from Barcelona to Paris) at the station in Spain or elsewhere. These must be printed on plain (A4/letter) paper prior to boarding the train, and cannot be presented on a mobile device. For information about ticket types and their availability, see also: Ticket delivery options. 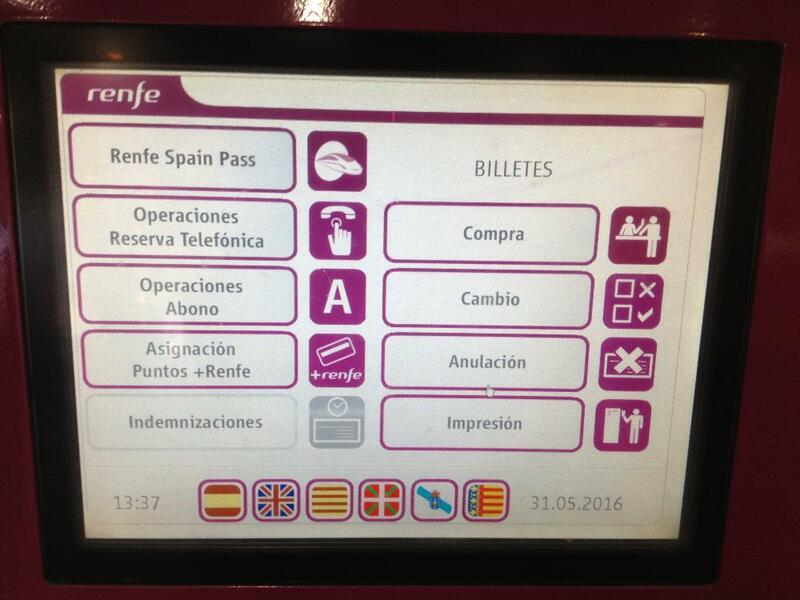 Renfe self-service machines can be found at the majority of stations across the Spanish rail network. 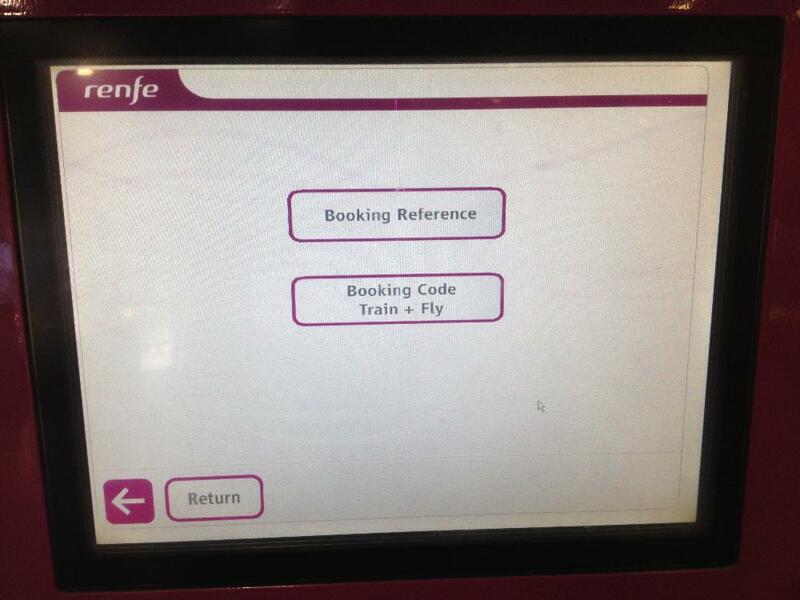 They feature the Renfe logo and are usually purple. 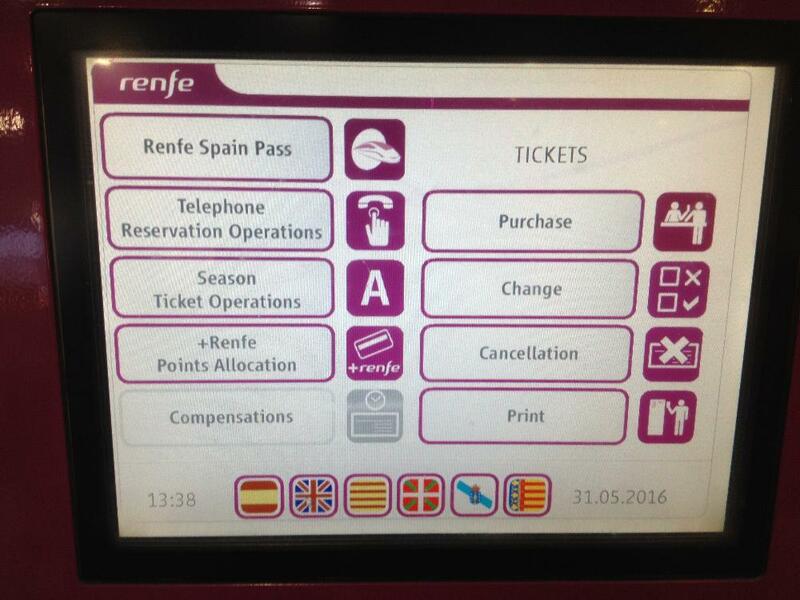 You can collect ticket from any Renfe station that has facilities, not just at the departure station. Tickets are usually available to print a few minutes after your online booking is complete. You can collect them at any time before departure. 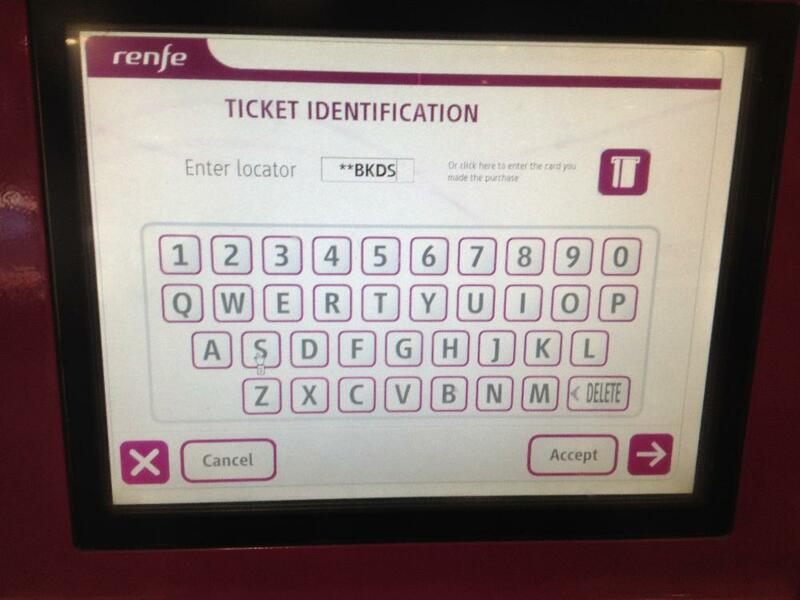 Your payment card is not required for picking up Spanish rail tickets purchased via Loco2. To select the English option, firmly press the UK flag on the touchscreen menu. Select “Print’” from the menu. Your booking reference, sometimes called PNR (Passenger Name Record) or localizador ("locator" in Spanish), is a six-character code which you can find on your PDF ticket or confirmation email. Please note that it is different from your Loco2 order reference, which is eight characters beginning with “LO-"). If you need help finding the localizador, see our guide to understanding your Spanish train ticket. Review the tickets that are associated with your reference number. If you're happy, hit "Print" or go back ("Return") if you've made a mistake. Your tickets will dispense from a slot beneath the screen. Each ticket and its print status will be displayed on screen. Make sure that all of the tickets have printed before leaving the machine.